This split-personality, cave-dwelling oddity, known to North Americans as the guacharo, doesn't seem to know whether it is bat or bird. It echolocates like a bat to perceive its surroundings, but as well as this crude form of sonar, the oilbird has the most sensitive eyes of any vertebrate. As Myers noted, oilbirds spend much of their time squabbling in caves, in colonies numbering up to 20,000 birds. Because of the immense numbers living there, the floor is carpeted with guano, which supports a host of insects and other small animals. The birds also put the guano to good use during the breeding season: they build nests with it. 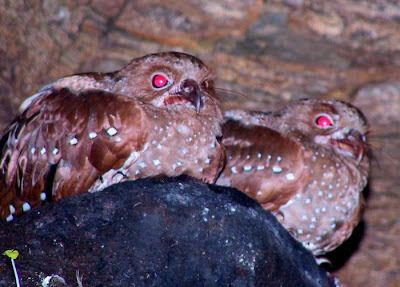 These birds may be vital to their forests's health, but that doesn't mean I want to spend a night in an oilbird cave. Thanks for the new bird, Morgan (a resident bird expert). And good luck in your studies. I wonder if they get most of the worms, after all it's the Oily Bird that gets the worm!